Do you often find yourself scrambling to get dinner on the table? Stop stressing over what to make for dinner and get The Six O’Clock Scramble, 160 healthy recipes that take just 30 minutes or less. Author Aviva Goldfarb created 32 weekly seasonal meal plans complete with shopping lists to help you save money, time and keep you healthy. The recipes are delish, too, and each one features a fun Flavor Boosting tip as well as nutritional analysis. Try the Smoky Beans and Greens over Quick Grits or Spaghetti with Creamy Avocado Pesto and Roasted Tomatoes. All recipes are designed to support a diabetic lifestyle, but everyone will love each and every flavorful dish. 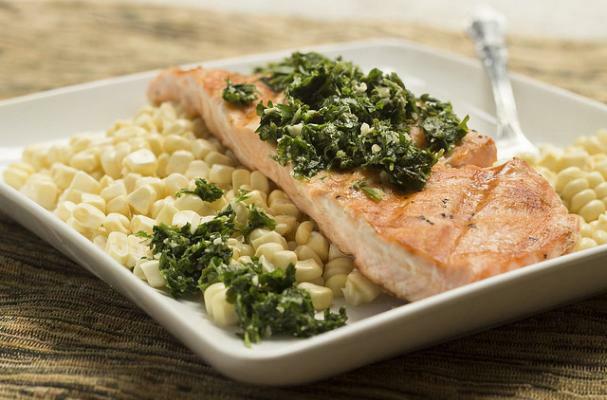 Make the following salmon dish on the grill or in your slow cooker. DO AHEAD OR DELEGATE: Make and refrigerate the pesto. 1. Preheat the grill to medium-high heat. Brush the top and sides of the salmon (or halibut) with 1 teaspoon of oil and season with salt and pepper. In a blender or food processor, puree the herbs, 2 tablespoons oil, the water, lemon juice, pine nuts, and honey. Transfer the mixture to a small serving bowl. 2. (Start the asparagus now, if you are serving it.) Grill the fish skin side down on top of aluminum foil or a grilling tray for about 10 minutes without flipping it, until it flakes easily and is no longer dark pink in the middle. (Alternatively, bake the fish in the oven at 400°F for 12–15 minutes until it is cooked through.) When the fish is done, slide a thin spatula between the fish and the skin, allowing the skin to stick to the foil or tray, and transfer the fish to a serving plate. Serve the fish topped with the herb pesto. FLAVOR BOOSTER: Stir 1/2 teaspoon lemon zest into the pesto. Copyright © 2016 American Diabetes Association. From The Six O'Clock Scramble Meal Planner. Reprinted with permission from The American Diabetes Association. Photography: Linda Wolpert. Reprinted with permission from The American Diabetes Association.